Today is the final day of my challenge, and so I have chosen a photo of one of my favourite solo hikes in 2014. 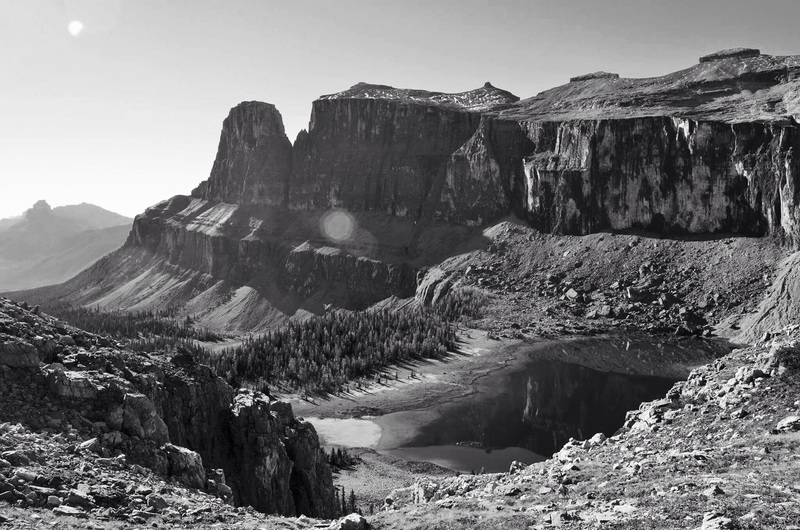 It is of Rockbound Lake in the amphitheatre of Castle Mountain in Banff National Park. It was an incredible hike to do, and I still can’t get over quite how amazing the view was. As part of the challenge you nominate a blogger friend each day to join in and take part. So today I nominate Travel Tales of Life with Sue’s excellent travels and adventures. A wonderful view of an astounding mountain. Thank you for the kind nomination. Fantastic. The black and white really let’s you see detail that would be lost in (what was surely) vivid color. Great pic! And I am getting to my posts soon! Thanks! I am enjoying it so far (but how hard can it be two days in?). And this weekend I’m going to get the black and white challenge ready – I have a great idea for that one, too (to be seen!). Love this scene, Rob. Any thought to cloning out the lens flares?